Progressive Party of Maldives (PPM) Parliamentary Group Leader Abdulla Yameen has been elected as the party’s presidential candidate to compete in the upcoming national elections. The preliminary results of the PPM’s presidential primary reveal that Yameen won with a total of 13,096 votes, beating rival candidate Umar Naseer’s 7,450 votes – a 63 percent majority, according figures quoted by local media. A total of 31,298 PPM members were eligible to vote in the party’s presidential primary through one of the 167 ballot boxes placed in 140 islands, Sun Online reported. Umar Naseer accepted defeat: “If it’s a free and fair election, I will always accept the final result. I believe so far the election has been fair. As I said we will know how to proceed once we assess the complaints,” he told Haveeru. Former President of the Maldives and PPM President Maumoon Abdul Gayoom congratulated his half-brother, Yameen, via Twitter following the announcement of the results. Gayoom had urged party members to take part in Saturday’s election, despite not casting a vote himself in order to remain “neutral”. During the voting period on Saturday (March 30), Yameen told local media that certain party members had been seen inside voting centres in Male’ using foul language in an attempt to start fights and create disorder. Private media outlet Raajje TV captured a brief scuffle on camera between supporters of the two presidential primary candidates Umar Naseer and Abdulla Yameen. The footage shows police being brought in to control the crowd, who are dressed in the party’s pink colour scheme. Yameen told local media shortly after casting his vote outside the Aminiya School in Male’, that despite the minor conflicts, the party would not split. “Overall, the voting is alright. But people from within the party have entered voting centres and have tried to start fights. “They have raised they voices, used foul language, this should not happen in an internal election. It is very sad,” Yameen was quoted as saying in Sun Online. On Friday (March 29), Yameen’s half brother, former President of the Maldives and PPM president Maumoon Abdul Gayoom, called for PPM members to show the world what a “responsible party” the PPM is during Saturday’s primary. The recent internal disorder among rival supporters follows a month of increasingly heated rhetoric between the two presidential candidates. Earlier this month, Yameen responded to several accusations made against him, claiming the “stories” to be untrue. “I have been accused of holding large sums of money in different accounts. I’m not responding to these allegations. But the people who work with me need public confidence. “I want to say to you, that there are several allegations targeted at me. But those allegations are baseless and unfounded. None of those stories are true. Don’t believe them,” Yameen was quoted as saying in local media. A spokesperson for Abdulla Yameen’s ‘Yageen’ campaign team told local media on March 23 that Umar Naseer had made slanderous and “blatantly untruthful” statements about Yameen during a recent rally. Speaking at the aforementioned rally, Naseer claimed that Yameen’s campaign team is forced to play “80 percent in defence” in order to denounce the public’s claims against him. “We heard our brother MP [Ahmed] Nihan speaking at Yameen’s campaign rally. All he did was try to denounce what the public says about Yameen,” Naseer said at a rally held on March 15. Earlier in March, Naseer claimed that he had received “intel” that an attempt would be made to “assassinate” his character by planting illegal substances in his offices. Following Naseer’s initial claims, he told supporters at a rally on March 15 that an MP involved in the illegal drug business was attempting to “frame him”. “[The MP] tried to ruin my reputation by sending police to my business offices in the pretence of looking for illegal substances. I do not get involved in such acts. On March 17, a police source told Minivan News that a bottle of alcohol had been found in a car belonging to Naseer’s wife when searched by police. Despite Umar Naseer’s comments, former President Gayoom tweeted earlier this month that external influences were attempting to split Yameen and Umar apart. “Some people from outside PPM are trying hard to drive a wedge between Yameen and Umar. All PPM members please be alert to this,” Gayoom tweeted. Just look at that evil smile! Indeed, as we predicted Yameen won hands down. Congratulations. Let's hope that he turns out to be a better politician than his brother ever was. Atleast by now Umar must have realized blood is thicker and Maumoon's family will always support anybody from the family but Umar. Illiyas Ibrahim would be wishing now that he had a child or children of his own because in spite of the fact that he treated Maumoon's children as his own and distributed his wealth primarily among them; they all deserted him when he needed their support to make a come back. Maumoon effectively destroyed his bright future; a person who convinced Ibrahim Nasir to accept Maumoon as his successor and did all the development in Maldives during first 10 years of Maumoon's Presidency; and a person who would have made a bloody good Leader. Just proves Maumoon nor his children have any gratitude what so ever. So Al Capone gangster will soon be running the country. We will get the country we deserve soon!! "So Al Capone gangster will soon be running the country. We will get the country we deserve soon!!" Never fear. As reported in Haveeru today, the infamous gangsters from Armenia known as the Artur Brothers are already working hard in the Maldives and have been seen in the company of ex-Colonel Nazim and Adheeb. 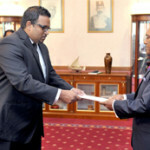 Adheeb, being Yameen's boy; it's quite obvious there are very dangerous deals going on with the Artur Brothers. These guys are notorious around the world, being involved in major narcotics trade, arms trade, prostitution and so on. Read about their escapades in Kenya (http://www.standardmedia.co.ke/?articleID=2000058816) where they were deported from. As I have mentioned previously, the Maldives has no laws on money laundering. It's quite clear that the Artur's are establishing a base here for their illicit trade, with the backing of Yameen, aka Al Capone and his men. Yameen's boys are projecting quite an image these days. One day, they are sailing on one of the biggest aircraft carriers of the United States Navy. The next day they are in the company of one of the most notorious gang leaders in the world, the Artur Brothers from Armenia! It is the Economic Minister who registered the company without security check who is liable should be on the spotlight here.